In the hurry-burry of jobs and housework, couples such as us sometimes are too immersed in our lives that we forget where we are and why are we working in first place , as someone said to “stop and smell the roses". However to literally do that you to grow your own or trespass someone’s garden .But taking it metaphorically ..we decided that its time to start exploring around Bangalore where could go and stay and probably get a sense of the beautiful place that we live. All good intentions need a push in right direction and that came when my parents visited us from Delhi. So, on a weekend morning we set off in 2 sets of cars , one with oldies ( parents and in-laws) and the other not so oldies ( we and my sis in law), for a weekend break to Our Native Village, an eco-resort as they call themselves. 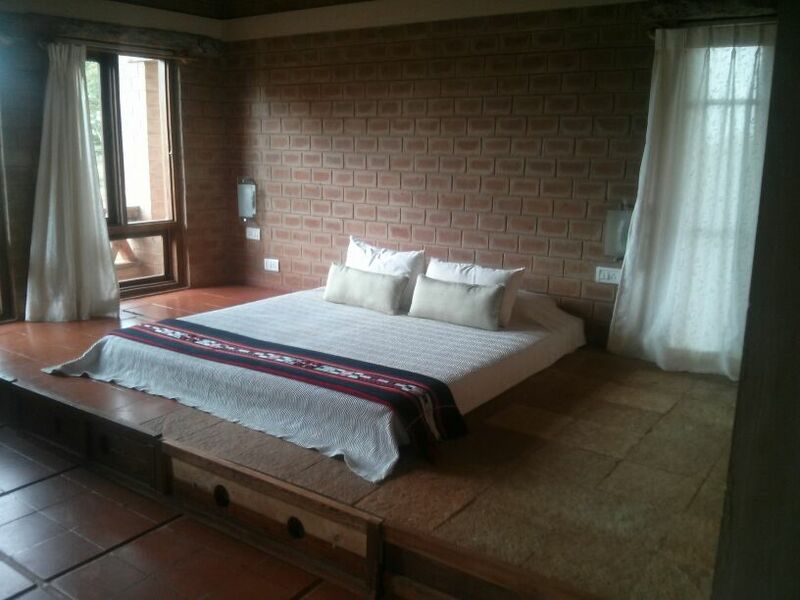 This retreat was located near Hessargatta Grasslands, about 33 kms from Bangalore. We did have a shorter route from home, but decided to make a pitstop at CTR in Malleswaram, for its wonderful, hot hot dosas( which Preethy declares she could kill for) and drowned it coffee . After this, it was us, Google Maps (wonderful companion) and the road! The drive was very breezy and delightful. Bangalore was in all its monsoon glory we could see lush greenery on either side of roads once we left the city . flowers , and even though all the resorts say welcome to our home , this one truly felt like one . We were then taken to our rooms , and pathway was lined with flowering frangipani which lent a nice scent to the air . 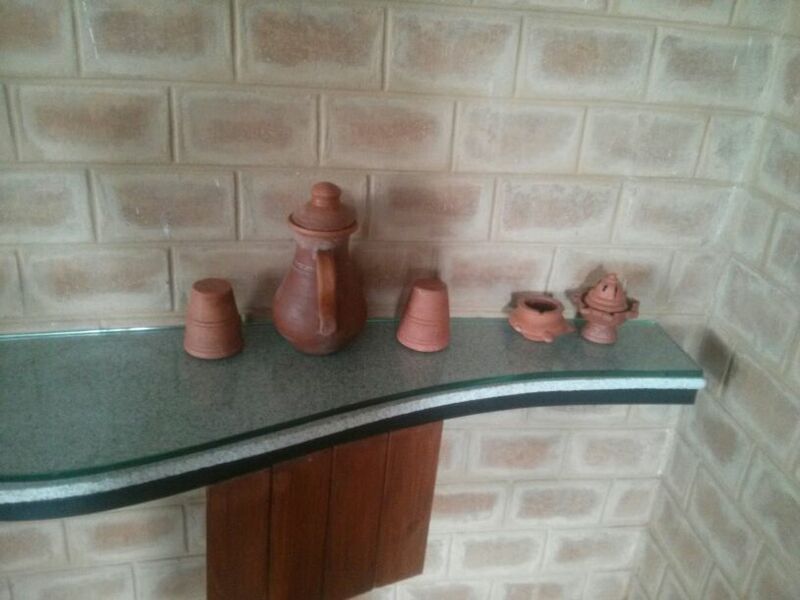 Water jug, glasses all terracota! Shampoo, Oils, Moisturizers in tiny earthen bottles, made locally by artisans! Post lunch was time to rest our bellies and explore the place , at the entrance there were 2 cows which were in small enclosure and were constantly chewing on fodder, one of them was a calf and was very timid and would just run if someone tries to pet her , the mother was little noisier , but busy eating .It was nice spectacle to enjoy! After a brief afternoon siesta (where Preethy, her sis and I continued to jump from one balcony to another), it was time to play some games! I cannot recall when was the last time we had so much fun. Here's a preview of what all we did! 2. Catapult shooting: A simple set up, with catapults and reusing soft-drink and beer cans. 3. 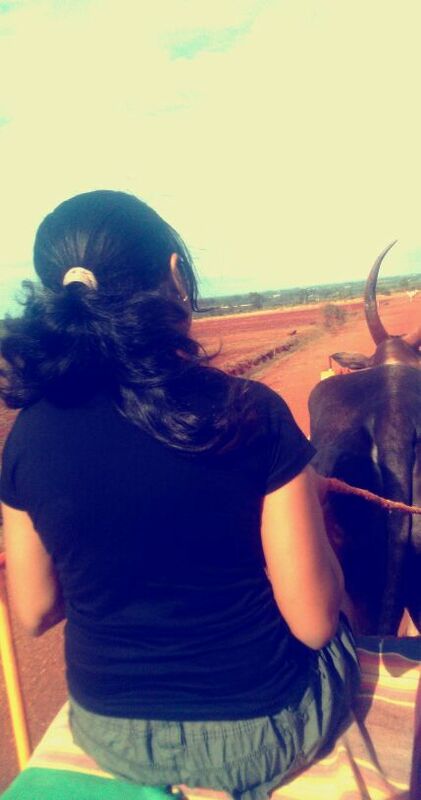 Bullock cart rides: This was too much fun. The bullock, called Basava, had a mind of his own. And was very possessive about his owner. If anyone else even tried to talk to him, he'd get violent. But being the guest friendly bull that he is, he let my sister-in-law maneuver him. 4. Kite flying: It was a very windy day to fly a kite, but nevertheless, we gave it a shot! It was the first time for us "kids" and we were super thrilled. Tea time, we got some roasted peanuts, and the staff very kindly told us to "litter the fields with the peanut shells"! We got to watch some live action kabaddi along with some cutting chai. As the evening set in, we got to see some Yakshagana before yet another simple, cozy dinner. The next day, after breakfast, we got to play around the potter's wheel, and made some small bowls and mugs. After that, was some good ol' family cricket time. I think this was the best part of our vacation. All of us playing together. Apart from this, we all got amazing massages at their spa. And had a lot of fun identifying all the plants that they grow in house! How many can you spot? Looking back, I can't believe we did so many things, in just 2 days. And whatever experiences we had, were simple, "earthy" and truly taking us back to not our, but our parents' childhood. Guys at Our Native Village: Thanks for giving us a memorable vacation. Hope to come again!